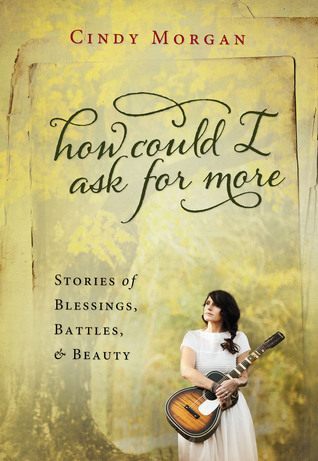 Award winning singer-songwriter Cindy Morgan's best-selling song celebrates the appreciation of the small blessings that make up a rich, full life. Here, she expands on this theme, sharing personal stories of her challenging childhood, struggles as a young adult, and the adventures of being a wife and mother. Morgan's evocative writing about the people, places, and experiences that make us who we are will touch the reader's heart, challenging them to understand God's many blessings-big and small. I really do enjoy reading other people's thoughts and life stories. This book, while rather short, was a good read. At times I thought it jumped around a lot but overall I was intrigued to read about Cindy Morgan's life. She is not someone that I have really heard of until now so I didn't have any preconceived opinions. Cindy's life is a good redemption story and it's interesting to read about her small blessings. I liked this book but nothing stood out to me that strongly effected me in some way. There didn't seem to be anything extraordinary about this book it's just a life story. I found it enjoyable. "I received this book from Worthy Publishers for free in exchange for an honest review."